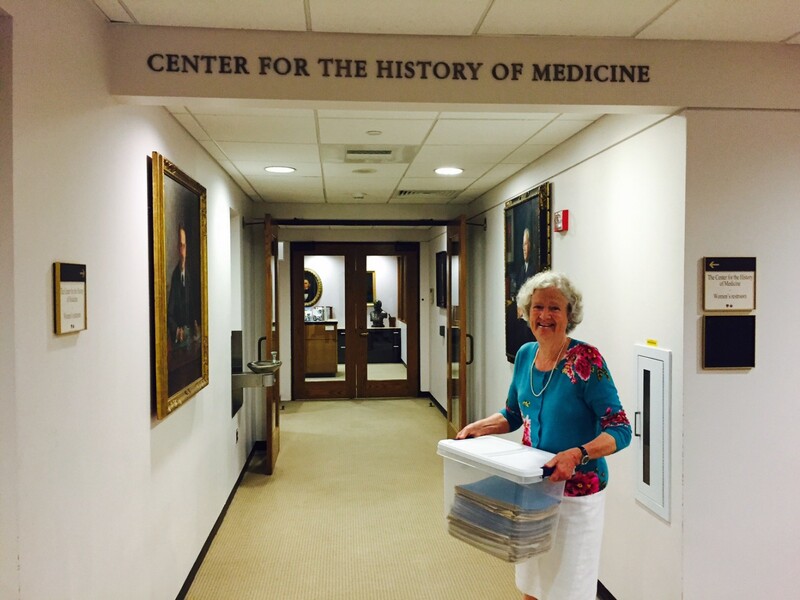 A note from Mimi Baird on her second trip to the Francis A. Countway Library of Medicine at Harvard Medical Library. (Her first trip occurred in the 1990s when the author was conducting research for the book). Shortly after He Wanted the Moon was released on February 17, 2015, I told my two children that Harvard Medical Library’s Francis A. Countway Library of Medicine was where my father’s original work should reside. Not only did my father attend Harvard Medical School, but the Countway Library’s very mission is to inform contemporary medicine and society through their vast collection of rare books, manuscripts, and archival collections. It seemed a natural and perfect fit. So when I received a letter from the acquisitions archivist at the Countway Library inquiring if I would consider donating my father’s manuscript, it was with great pleasure that I answered in the affirmative. 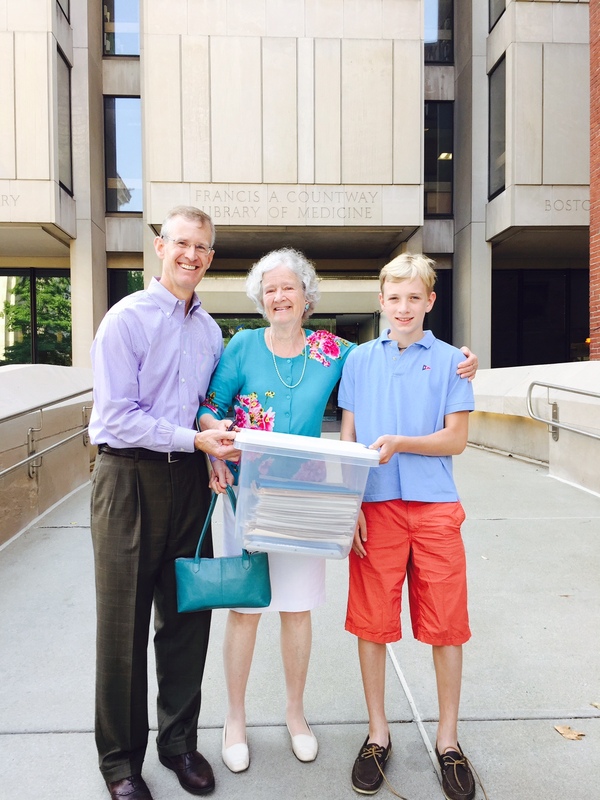 On September 2, 2015, I, along with my son and grandson, arrived at Countway. The archivist who had contacted me, Carolyn Hayes, joined us, as did Kate Bradley, the woman who had transcribed the entire manuscript in January of 2013. After taking photographs outside Countway, we entered the massive and august building. Surrounding us were paintings, portraits, and a multitude of significant images and exhibits associated with the world of medicine. Starting down the long corridor leading to the Center for the History of Medicine’s offices, I noticed two large portraits on either side. The one on the left was Paul Dudley White, the famous cardiologist who treated President Dwight D. Eisenhower. When my mother remarried, we moved into Dr. White’s former home. His library was my bedroom and is described in He Wanted the Moon when I last saw my father. Seeing Dr. White’s image was awfully exciting, but then as the others walked ahead, I checked out the portrait on the right: J. Howard Means, my father’s mentor. I have two huge folders of correspondence between Dr. Means and my father that I obtained from Countway years ago. I never knew what he looked like. I was stunned. What a kind and benevolent man he was—the ideal doctor. One of the most gripping scenes in the book is when he and my mother visit my father at Westborough in the winter of 1944. In gazing at Dr. Means’ portrait, it seemed to me that he had been waiting for us to arrive. We proceeded along the corridor, through a maze of offices and a research area, and finally entered an impressive board room. The walls were lined on two sides by locked cases that contained books which had been produced before the Guttenberg Bible, the advent of the type set. We settled at the long wooden table and opened the box containing my father’s work. Kate had never seen my father’s original writings. At the time she transcribed his work, these many pieces of paper were lodged in a large safe deposit box at my bank in Woodstock, and she had worked from my son’s Xeroxed copy. She took out the papers and put them into three piles. On the top of one group was a page showing an example of his handwriting in saner times, while the second pile’s top paper showed his manic, angry side. The piece on the top of the third group was a page that showed the following phrase: “Somehow I cling to a feeling of confidence in the belief that my own personal destiny has some strange meaning beyond that which I can see in the past or predict for the future.” We all agreed there was a presence in this room. After discussing the care and use of my father’s manuscript in the years to come, I signed a document indicating the work was being left at Countway. This simple swipe of a pen means these papers will be safe forever. Carolyn stated that whenever we need to see the document again, all we need to do is just let them know when we are coming. Carolyn also indicated that the library would like to have all my research work. In other words, there will be a Perry C. Baird, Jr., MD and Mimi Baird Collection at Countway. After saying our good‐byes and leaving the building, a wave of emotion swept over me. My father’s wish had come true. Always the teacher, he wanted to defray the stigma of mental illness through education. His work will be researched for many years to come and will, in the process, help bring mental illness out of the dark and into the light.